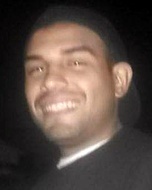 Rudy Sebastian Garcia, a 22-year-old Latino, was shot and killed Wednesday, Jan. 11, in the 4200 block of Acacia Avenue in Pico Rivera, according to Los Angeles County coroner’s records. Garcia and a male friend were standing near the friend’s car in the middle of the street about 12:47 a.m. when an “unknown figure” approached, pulled out a gun and shot Garcia in the upper body, said Los Angeles County Sheriff’s Sgt. Bill Cotter. Garcia ran a short distance before collapsing, Cotter said. He was pronounced dead at the scene at 12:54 a.m. with multiple gunshot wounds, according to coroner’s records. Investigators don’t have any information about the suspect or a possible motive, Cotter said. Garcia’s friend was not injured, but he has "remained uncooperative with us,” Cotter said. Desiree Garcia said her brother was a kind-hearted man who grew up in Pico Rivera and attended El Rancho High School. Anyone with information is asked to call the Sheriff’s Department Homicide Bureau at (323) 890-5500. Those wishing to remain anonymous can call Crime Stoppers at (800) 222-8477. — Rosemary Hernandez March 16, 2018 at 9:14 p.m.
— Janae Machuca May 21, 2017 at 1:48 p.m. I think it is a total shame what happens in Los Angeles and all of its surrounding areas ! The more I read about these killings, the sicker I get. I cannot simply comprehend how used this State is to these killings and I know for a fact that something much more drastic needs to be taken place ! This is not normal. How come they cannot come up with a SYSTEM to stop all this CRIME ? I hope and pray they get caught soon and that he will pay the maximum price. R.I.P. and may God keep you well in His Glory...I lived in Los Angeles for 5 years (Dec., 2011_ Sept., 2016 ), and I was afraid to even walk anywhere ! So, I moved back to Florida. Unfortunately, my oldest Daughter and husband remained there, and my 24 years old Grandson is there too. California would be so much nicer if they did something about catching these criminals! — Maria L.Fried Feb. 1, 2017 at 11:12 a.m.
— Don Trump Jan. 21, 2017 at 3:38 a.m.
— Salina Murrietta Jan. 18, 2017 at 8:52 p.m.
— Tina marie luna Jan. 18, 2017 at 5:42 p.m.
My brother Rudy Sebastian Garcia was a kind hearted man who always had a smile on his face and he loved his son very very much.. I'm going to miss his smile and his laugh and his hugs..
— Desiree Garcia Jan. 18, 2017 at 11:54 a.m.